There may not be a dish that’s as quintessentially American as apple pie. A flaky (preferably homemade) crust cradles filling of crisp yet tender apples spiced with cinnamon and sugar. Some top with another layer of crust, others opt for a crumbly streusel topping. While we’re often of the belief that classics shouldn’t be touched, apple pie is a dish where variations and enhancements are not only welcome but encouraged. One of the main problems we often see with classic apple pie, especially ones that are piled high with filling, is that the apples don’t get evenly cooked. The ones on the top and bottom, closest to the heat, get soft and tender while the pieces in the middle remain raw, crunchy, and uncooked. To solve this problem while adding another layer of texture, Audra slightly cooks the apples in brown butter then envelopes them in a luscious custard mixture. As the pie bakes, the custard becomes soft and creamy with pieces of tender spiced apples scattered throughout. On top, she covers the pie in a simple streusel topping which becomes crunchy and sweet as it bakes. (See our secret to the crumbliest streusel topping here). The best part about this pie is that it’s equally as good warm as it is cold so feel free to make it a few days in advance to satisfy your pie craving at any time. A woman of many titles, Audra is a newlywed, expectant mother, performer, and the heart and soul behind The Baker Chick. She created her blog in 2011 to document her culinary adventures in her tiny New York kitchen and hasn’t looked back since. With years of baking under her belt, Audra has discovered the secret to a life filled with sweets — sharing is caring! She’s quick to enjoy her creations with friends and family and shares her great recipes and beautiful photos with the rest of us. Head over to The Baker Chick and say hello to Audra on Facebook, Twitter, and Pinterest. 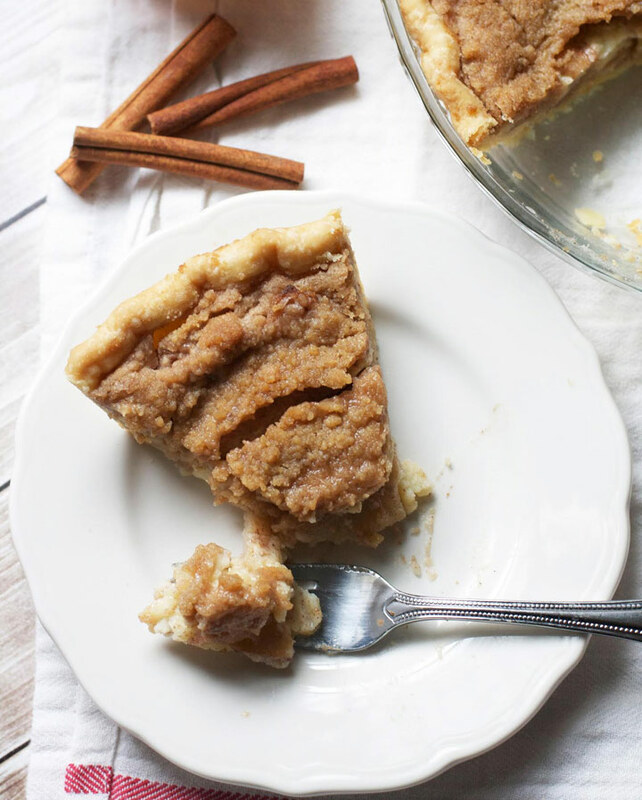 Here's a handy tip to help you make this Brown Butter Apple Custard Pie recipe.